Paragon Rehabilitation is proud to partner with Trilogy Health Services, a senior living provider based in Louisville, Kentucky that received a CMP Grant, valued at $300,000, that will allow Trilogy to invest in resident wellness via groundbreaking technology fittingly titled ‘It’s Never 2 Late’ (iN2L). Shane Stuber, Assistant Vice President of Foundation and Workforce Development, became aware of the incredible possibilities of It’s Never 2 late the moment he saw the technology in action. iN2L’s programming provides nearly limitless opportunities for fun, education, and exploration, all with the needs and abilities of seniors in mind, including those with mild to severe dementia. Thanks to iN2L, men and women who rarely wanted to leave their chairs were shown standing, exploring the interactive applications, asking questions, and regaling their caregivers with stories from their past. The equipment also boasts unique mobility capabilities and specialized programs that can help residents experience positive therapy results, improve their balance, and decrease their risk of falls. Mindy Lankenau, Senior Vice President of Clinical Services, and Madhu Krish, Chief Operating Officer at Paragon Rehabilitation worked with Shane Stuber from Trilogy Health Services to develop a strategy for using the equipment, as well as compose a request for the grant. Their goal was simple –to utilize iN2L to decrease falls in their at-risk population, as well as improve quality of life for all campus residents. Paragon Rehabilitation therapy departments in each Kentucky-based Trilogy senior living community will be receiving a iN2L Mobile FLEX machines, which include a 23-inch touch screen on a one-of-a-kind, portable stand that can be adjusted anywhere from 20 inches off the ground to 6 feet, 5 inches in the air. Each of these campuses will also receive an iN2L Mobile FLEX machine to use in the Life Enrichment Department. These machines will be married via their interface, and each resident who has been identified as having an advanced mental impairment will have their own personal profile, which will allow both Paragon Rehabilitation therapists and Life Enrichment team members to easily view their recent activity, therapy progress, and favorite games and programs. “We couldn’t be more excited about this partnership with iN2L,” commented Shane Stuber, Trilogy Health Services. 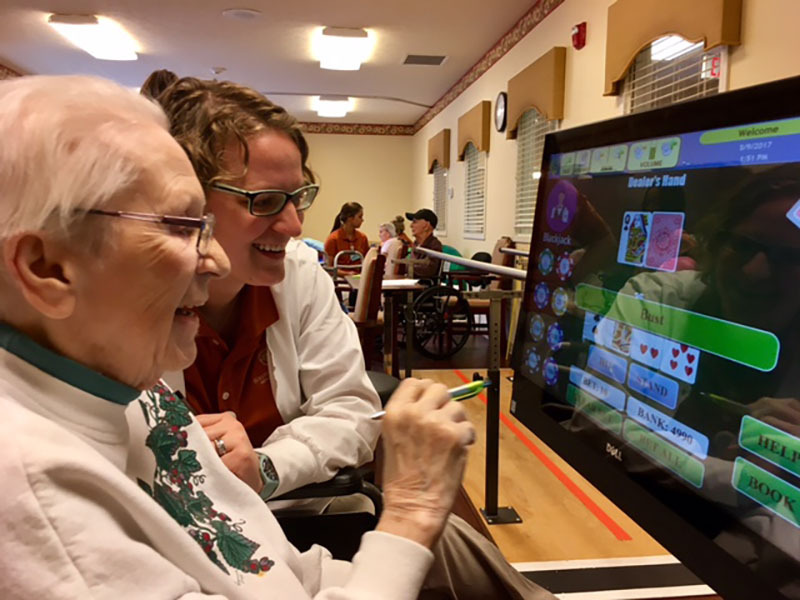 “We’re very proud to be the first senior living provider to use this technology across both our Paragon Rehabilitation Therapy and Life Enrichment Departments in order to decrease falls. Our iN2L machines will be available for use throughout the entire day and evening, especially during time periods when falls are more likely to occur, such as after dinner and before bed. We look forward to sharing the results of this partnership, and are extremely grateful for the CMP Grant that has allowed us to take our services to the next level.” Paragon Rehabilitation is also very excited about this grant and this innovated equipment that allows us to achieve positive outcomes for our residents at Trilogy campuses in Kentucky!